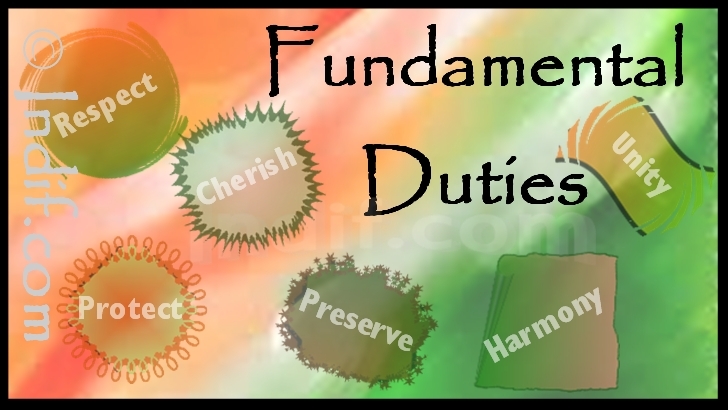 The fundamental duties are defined as the moral obligations of all citizens to help promote a spirit of patriotism and to uphold the unity of India. Rights and Duties are like two sides of a coin, absolutely inseparable. Whenever and wherever we have any rights, we must have corresponding duties. Fundamental Duties of citizens serve a useful purpose. In particular, no democratic polity can ever succeed where the citizens are not willing to be active participants in the process of governance by assuming responsibilities and discharging citizenship duties and coming forward to give their best to the country. Originally, the constitution of India did not contain any list of fundamental duties. The Fundamental Duties of citizens were added to the Constitution by the 42nd Amendment in 1976, upon the recommendations of the Swaran Singh Committee that was constituted by the Government of India earlier that year to study the question of amending the Constitution. The recommendations were passed in 1976 and came into effect on 3rd January, 1977. These duties have been taken from the constitution of Japan. Originally there were ten fundamental duties. Further, one more Fundamental duty has been added to the Indian Constitution by 86th Amendment of the constitution in 2002.
to strive towards excellence in all spheres of individual and collective activity, so that the nation constantly rises to higher levels of endeavor and achievement. wwho is a parent or guardian , to provide opportunities for education to his child, or as the case may be, ward between the age of six and fourteen years. The Value and significance of the fundamental duties is that they serve as a reminder to the citizens that while enjoying their rights, they should also be conscious of duties they owe to their country, their society and to their fellow citizens. They are alsos a warning against the anti-national and antisocial activities. They are a source of inspiration for the citizens and promote a sense of discipline and commitment among them. They help the courts in examining and determining the constitutional validity of a law.They are enforceable by law. Hence, the Parliament can provide for the imposition of appropriate penalty or punishment for failure to fulfill any of them. Although these duties are non justifiable and non legally enforceable it is expected that every Indian citizen follows them diligently. If instead of insisting on rights everyone does his duty, there will immediately be the rule of order established among mankind. There is no such thing as the divine right of kings to rule and the humble duty of the riots to pay respectful obedience to their masters. In Swarajya based on Ahimsa people need not know their rights, but it is necessary for them to know their duties.